Reader question… “I have a hosta that has gotten very big and is developing an empty area in the center. My neighbor told me it needs dividing, but I don’t know how to do it. 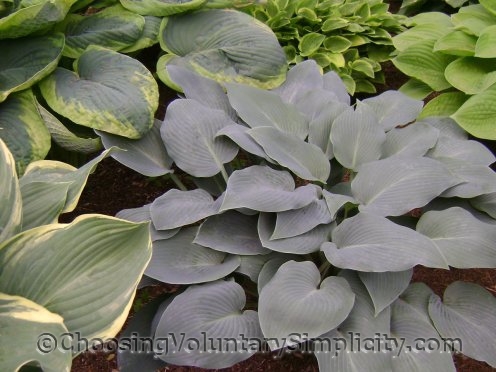 Can you share how you divide your hostas? I am new to growing hostas and don’t want to kill it with my inexperience.” –Sheila T.
Here’s how to divide a hosta… start by using a shovel to loosen the soil around the hosta and lift it up out of the ground. Each hosta will be different, but if you look closely at the hosta and the way the groups of leaves come out of the roots, you can usually see where the hosta should be divided. Once you have decided on the where, use a shovel or a sharp knife to make vertical cuts between the shoots and down through the clump of roots. Each cut will separate the individual shoots and make a new division. An alternate way to divide a hosta, and the one I prefer if at all possible, is to wash away all the soil from the roots with a hose. Once you are able to see the bare roots, you will be better able to see where the cuts should be made. Sometimes the roots can even be teased apart from each other without any cutting at all, but if roots do need to be cut, the cuts can be more precise. Hostas divided this way experience less stress and will recover much faster than hostas that have been cut apart with the shovel method. Dividing a hosta is a simple process, but I have to admit it is not something that I like to do. I like to let my hostas grow to very large sizes, so I do not usually divide them until they get too large or, like yours, develop a “fairy ring” that leaves me with no other choice. We have very severe winters here, with temperatures often dropping to forty below zero, so I try to divide hostas in the spring, just after the eyes have started to grow. When I divide hostas that early in the season, they have a whole growing season to develop roots and become established in their new location… also, the hosta will look more aesthetically pleasing during the summer than a hosta that is divided after the leaves have appeared. However, hostas can be divided almost any time of the year, as long as you protect summer divisions from heat and lack of moisture during the summer, and protect fall divisions from winter damage by covering them with a thick layer of mulch. I try not to let my hostas get too big. I have purchased about 8 of them for division purposes. This is my frugal gardening method. I let them grow for about 2-3 years and then divide into roughly six pieces each. I love Hostas. I saw a white Hosta a black and a blue that would look uniquely exotic in my garden. I am watching the price on them since they are more costly than the green Hosta’s. this post is very helpful. There are also some great videos on youtube.com showing how to divide a Hosta. 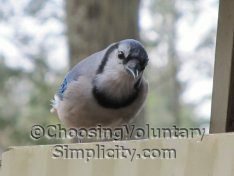 Hello, I was reading your post on dividing hostas, which I know how to do but this year I have a bit of a dilemma,…I am a landscaper and have a property on a garden tour this summer…and although I know about plants and dividing them…I am finding myself sitting on the fence about dividing hostas and sedum this summer…I have a few that are huge…probably over three foot diameter and by the time they have bloomed…the sedum is falling over…so I am trying to decide if I should let it go another year…or divide it this year…my concern is losing the dramatic affect of the large plant…it is stunning until it flops…I fear if I divide it…I will end up with fine plants…but in the end…three or four average looking plants. Any suggestions?…do you think if divided into thirds, that it would still be a large plant, and do you think it will fill out to the nice mounded shape the first growing season?…I should know this..but I usually try to get as many plants as possible when dividing. (usually divide into quarters)..so I know the plants will be much smaller the first year. Like I said…im just stressin cuz of this garden tour…I don’t want to take the drama out of the gardens as well as have it look like a newly planted landscape. Thanks for any in put you might have. ps…also facing the same issue with a hardy hibiscus, some large fountain grass, and hosta…need to be divided…but am I shooting myself in the foot if I do it this spring? I don’t want to lose the drama that I have created and have everything look flatline…not too mention…that a few of these really take over others when they are in full bloom. Kurt, I would wait to divide the plants if you want them to still look their best during the garden tour. It really depends on the hosta, but usually it will take a while to look its best again after being divided… especially if you cut it apart. I agree completely. If you’re going for looks, wait to divide those plants because they won’t look as good for a while after you do divide them. You might get lucky and have two complete root systems, but usually you will have to cut and that will leave a misshapen hosta. So I would wait. Hi, I am in Ontario so we also get very cold winters. I am planning on dividing a number of hostas and putting them in a new garden we are starting. Based on your article, I think I will wait until spring to divide them. However, I was wondering, do you do anything with them throughout the year like clipping or removing leaves or stems. I just learned about deadheading my blanket flowers to keep them blooming so I am interested in knowing what else I don’t know. Susan, I don’t do anything to the hostas except try to keep them protected from slugs. Sometimes if a leaf gets broken or sunburned I might cut that leaf off, and I do cut the flower stalks off, but that’s about it.